This is the obvious one and a part that Williams was mooted for for some years. Clearly the role eventually went to the suitably willowy Jim Carrey, who did a good job, but this has to go down as one of the greatest missed opportunities in one hundred years of Hollywood casting. Just imagine the complexity he’d have brought to the character. Obviously he’d have been great as the manic, giggly, prancing around the room stuff but he could have been amazing as the villain’s alias Edward Nigma too. So many of Williams’ roles were defined by that dichotomy of serious and funny and this could have been his perfect Jekyll & Hyde. Frankly it was painful watching Steve Martin gurn his way through this film, trying hard to be as animated and zany as the cartoon characters that surrounded him. I mean, for goodness sake, what human being could possible match Daffy Duck and the Tasmanian Devil when it comes to physical comedy? I’ll tell you who. Williams’ Good Will Hunting co-star Stellan Skarsgård was fine as Erik Selvig in his first two appearances but after Loki had played with his brain he started to go a little crazy. If you wanted someone to start out all brainy and serious before going nuts and forgetting his trousers then Robin Williams was your guy. I just would have loved to have seen Robin Williams in The Princess Bride. I thought about giving him the part of Miracle Max but I couldn’t do that to Billy Crystal. Williams would have made a pretty good Count Rogan too and he’d have nailed the Grandfather, but for the fact that he’d have been 36 at the time. 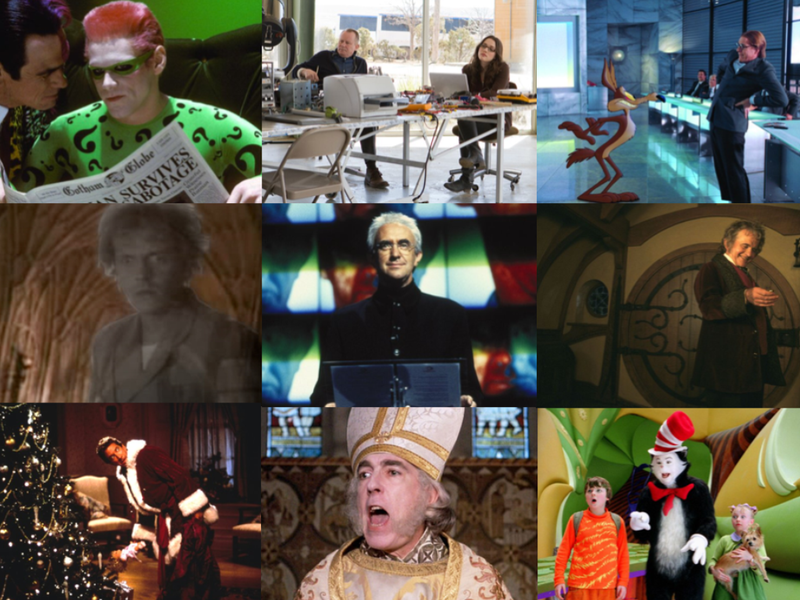 In the end though I decided to give him Peter Cook’s part. Admit it, that little cameo would have been excellent. That sinister side of Robin Williams could have worked really well in this film too. I like Jonathan Pryce but he was a fairly lacklustre bad guy. He just seemed like his mind was elsewhere and he kept breathing in an odd manner, like he was trying to keep down a bug he’d swallowed. Wouldn’t Williams have been a great Bond villain? He’d have had the flamboyance of Goldfinger combined with the unhinged menace of Max Zorin and the comedy accent of Valentin Zukovsky. Okay, stick with me on this one. Ian Holm was great as the elder Bilbo but did he genuinely own the part? I’m not sure he did. The idea of Williams in the role looks, at first, like distracting stunt casting but he could do old and pensive with the weight of experience evidently pressing on his shoulders. Just think of his bearded roles in Awakenings and Good Will Hunting. The moment in the first film when Bilbo goes evil schitzo over the ring after seeing it in Rivendell was a bit of a throw away moment but it wouldn’t have been in Robin Williams had done it. Tim Allen was okay as the wise cracking divorced father (just as Robin Williams was in Mrs Doubtfire) but he made a terrible Father Christmas. Robin Williams would have been a great Father Christmas. Robin Williams sensibilities would have been perfect for Dr Seuss. I thought about putting Robin Williams forward for The Grinch but I’ve already stripped Jim Carrey of one part. Having also considered Williams as Shrek, I ultimately settled on bumping Mike Myers from The Cat in the Hat. Austin Powers just never seemed right in that part, he didn’t seem to be able to relax in to it. It was like his mansized cat costume was zipped up too tight. Robin Williams would undoubtedly have done a better job and would would definitely have had lots of good fun that was funny. He could have mocapped for Thing 1 and Thing 2 as well. It would have been bonkers.